I’m like a giddy child in the run up to Christmas – this year I was considerably more excited than the kids at school. From the 1st December, when I opened the first door on my advent calendar and broke out the Christmas songs, my festive spirit rose and soared to a glorious crescendo on the 25th. But once it’s over, it truly is over for me, and the day itself seems to fly by all too quickly. Never having celebrated New Year when I was growing up, there’s nothing more to look forward to beyond Christmas Day and it’s easy to feel a bit deflated at the return to normal life, especially this year when my mum left Hong Kong on the 27th and I was back at work on the 28th. The rise and fall of my merriment are mirrored beautifully in the lovely little souffle I made for our Christmas dinner starter. Cooking in my little mini oven, much to my delight (and relief!) it rose up fantastically. Out it came to the table, where we admired it and took it as a good omen for the meal to come. But all too quickly it began to sink back down. It’s just as well we’re hasty eaters in my family! It was absolutely scrumptious anyway. The Cheshire cheese smelled incredible, even if the taste wasn’t quite as strong as the aroma suggested. 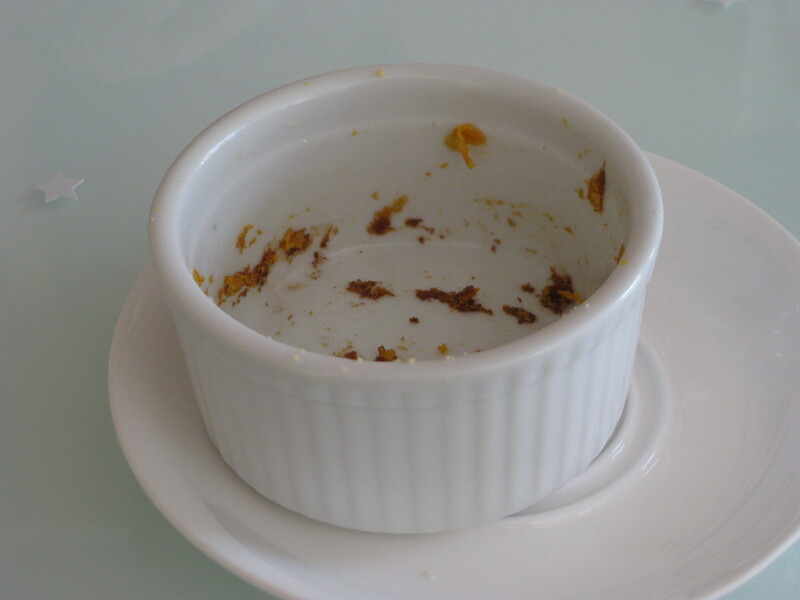 Not only did it taste good, but it also instilled in me a certain sense of smugness that I’d triumphed in the souffle stakes (even if only temporarily). If you too like cheese and feeling pleased with yourself, by all means give it a go! Fortunately my post-Christmas slump is drawing to an end too as I’m making plans and day-dreaming about the year to come. Happy 2012, let’s make it a great year! 1. Heat oven to 200C. Butter 6 ramekins and dust the inside with Parmesan (put a spoonful of cheese in the ramekin and rotate it so that it sticks to the butter and the whole inside of the ramekin is coated). 2. 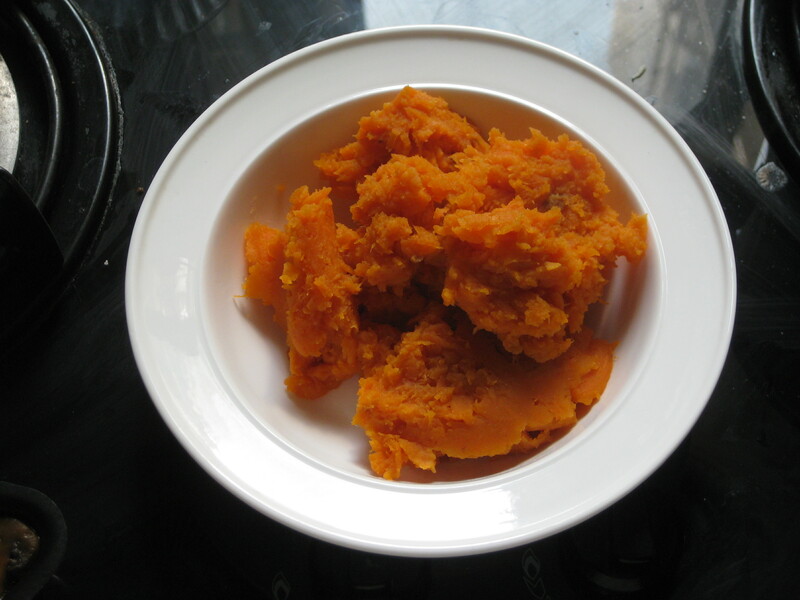 Cook the sweet potatoes in boiling water for 10-15 minutes, then drain and mash them. 3. 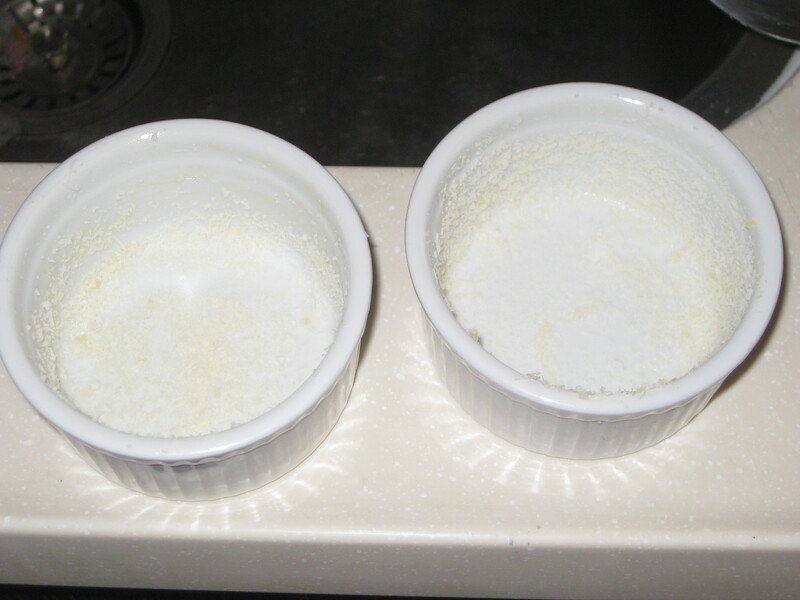 Melt the butter in a saucepan, then stir in the flour. 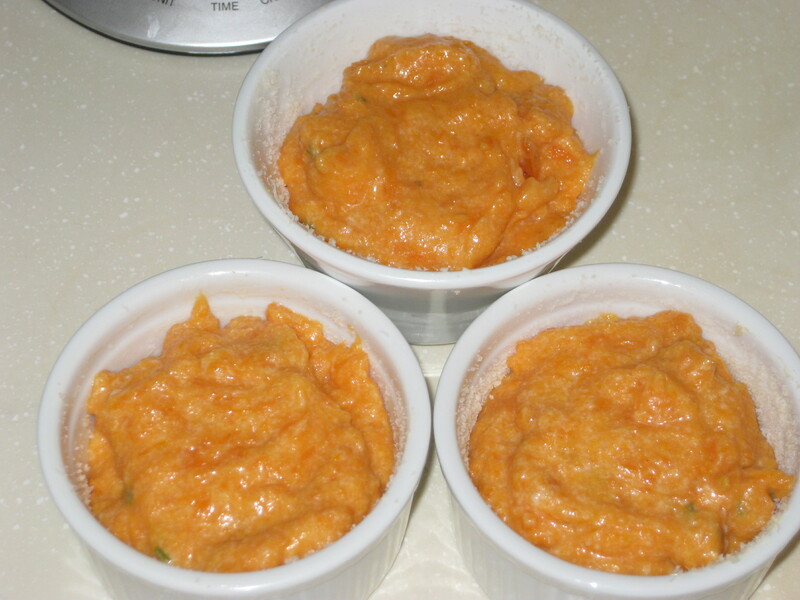 Gradually add the milk, mixing well between each addition until it forms a smooth sauce. 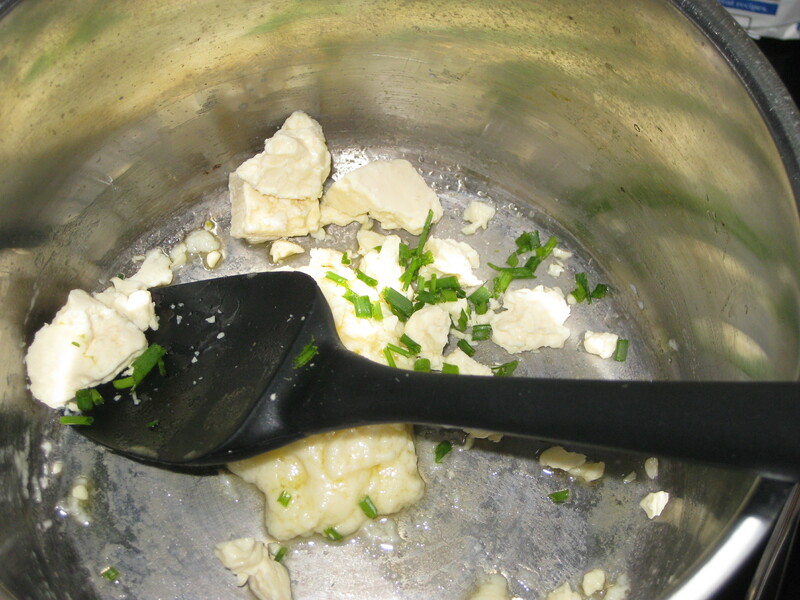 Crumble in the Cheshire cheese and stir until it has melted in, then add the chilli flakes and chives. 4. Remove the pan from the heat and fold in the mashed potato. 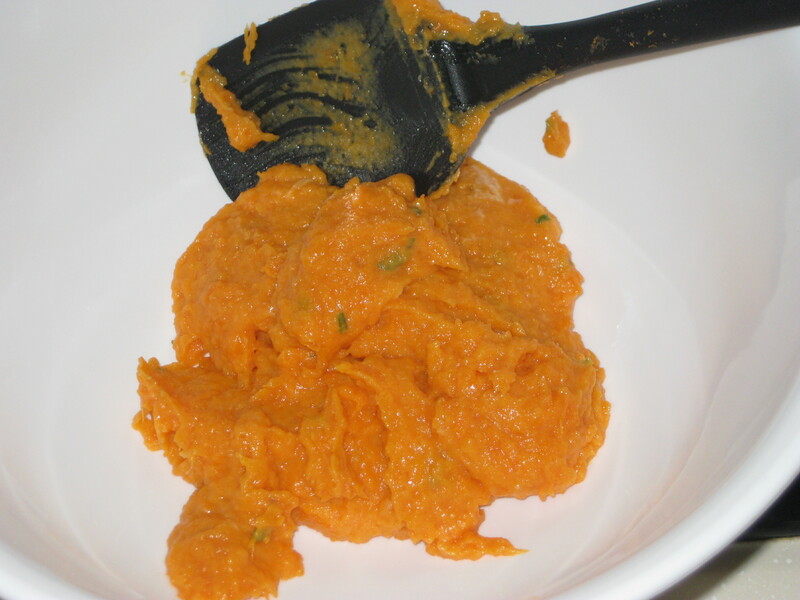 Separate the eggs, and stir the yolks into the sweet potato mixture. 5. 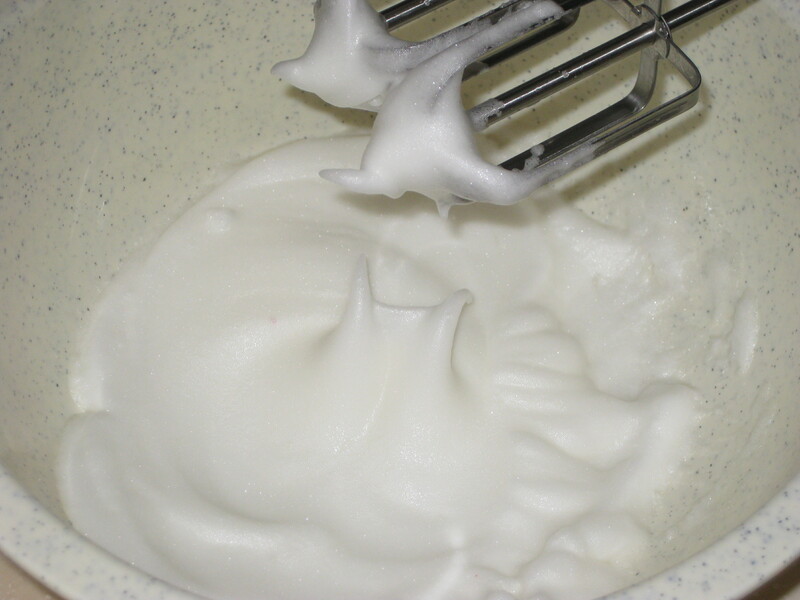 Put all the egg whites in a bowl and whisk until they form stiff peaks. 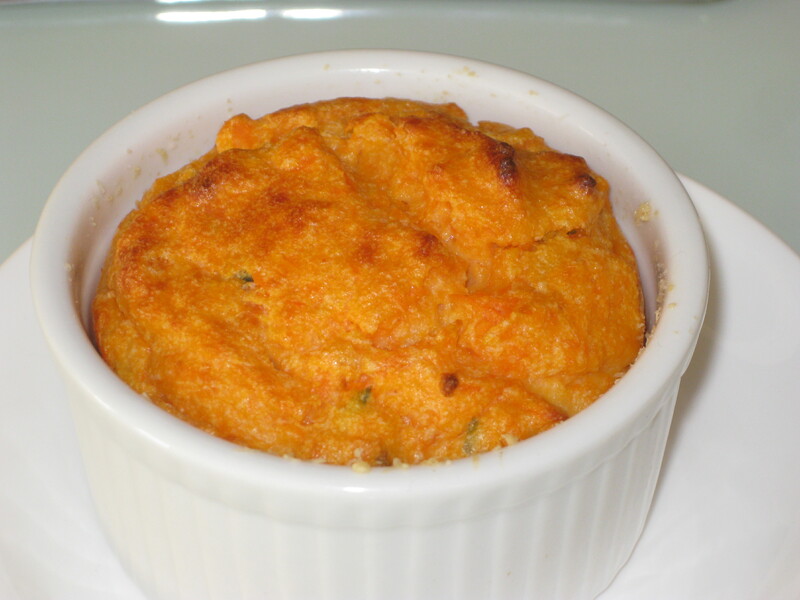 Fold a quarter into the sweet potato mix, then fold in the rest, trying to keep as much air in it as possible. 6. 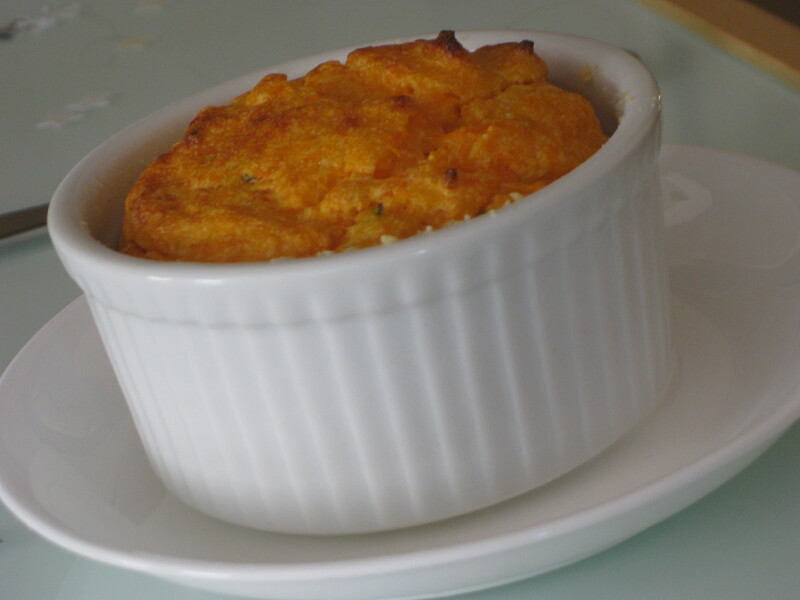 Divide the mixture between the prepared ramekins and put them on a baking sheet. Bake for 20-25 minutes, until risen and golden. Get them on the table quickly before they begin to sink! 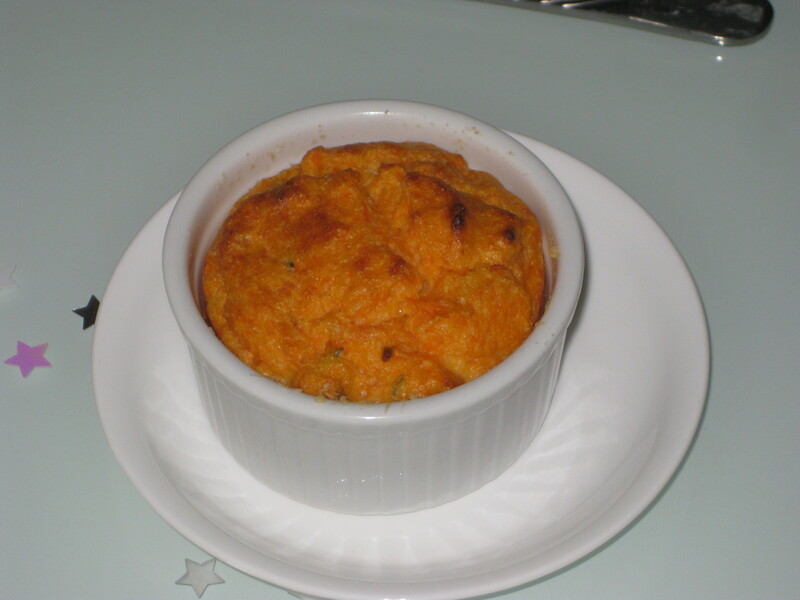 This entry was posted in Vegetarian Recipes and tagged Cheshire cheese, Christmas dinner, souffle, starter. Bookmark the permalink.